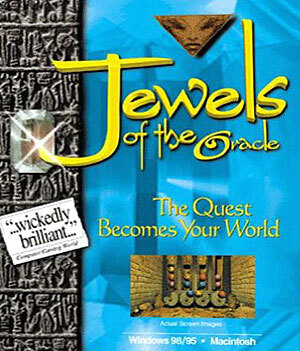 Jewels is now an old grand daddy of a CD-ROM game, JOTO came out around the same time as MYST. Although there were not as many immersive worlds to explore, Jewels had many more puzzles and a much larger video frame. I began the project in 1992 because I loved the idea of virtual, interactive 3D environments. The early virtual worlds were "flat-shaded" with no shadows or had only single spot highlights and very low polygon resolution, but the idea of walking around in a rendered world on a computer screen really appealed to me. I had also read Snow Crash by Neal Stephenson - a visionary VR story way ahead of its time. My inclination toward puzzles and middle eastern archaeology came together in an atmospheric realm of exotic music and distressed texture maps. Jewels was translated into many languages and distributed all around the world. It even appeared in a Japanese version on the first SONY Playstation. Check out the wide range of reviews online. 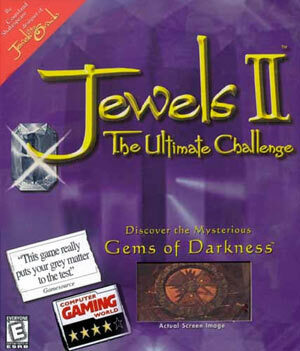 Jewels II (1997) had even better reviews than the first game. We moved up to SGI (Silicon Graphic) computers for modelling, rendering and lighting and solved some of the previous game's interface issues. Unfortunately, the distribution of J2 was less than ideal. Despite having what looked like a hit game, the product didn't find its way onto the shelves. The game was originally called Gems of Darkness, because the initial distributor of JOTO went bankrupt and there were legal issues with the name. A later distribution contract brought the rights back and the name was restored to Jewels II - even though it was a completely different production crew. The top left corner of the box had a red triangle with my name in it to let people know it was created by the same person as JOTO. There were a lot of imitators back then. Even the inventor and creator of Tetris adapted my idea of a puzzle collection. Of course, he was later distributed by Microsoft, so maybe that helped, because he never got properly paid for Tetris, but that's a whole other topic I cover someplace else. The development company of JOTO was ELOI Productions, but when the money failed to show up I started a new production company called Bardworks Ltd. We were located on the third floor of the famous Flat Iron Building in downtown Toronto - right in the "point" office. I have very fond memories of that office. 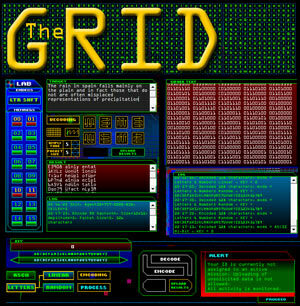 The GRID (2001) was the next game project - an interactive online game idea. We called the project a "hacker simulator," because the game idea was about international security and secret message encryption and international terrorism. We had a fabulous ad campaign and great sponsors involved. Our production office was located in Rockefeller Center in New York City and they were wonderful times until September 11, 2001. The project goes back to the early 1990s when I was interested in the history of secure communication and encyption technologies. I originally conceived it as an enormous "interface puzzle" where the player has to figure out a massive series of simulated security application programs. I thought it might make for some challenging entertainment. Unfortunately, the fun got taken out of it when the internet started being misused by identity theives, hackers and real terrorists. The game was not sold in stores, because it would be played entirely online. It had its own radical and innovative messaging and online mail system and a whole suite of sub-applications for solving the game challenges and figuring out the story. These included a number of historical encryption algorithms for encoding messages. We called it The Lab (programmed by good friend Jon Child). The game also incorporated sponsors and advertising so it could be played for free by players around the world. 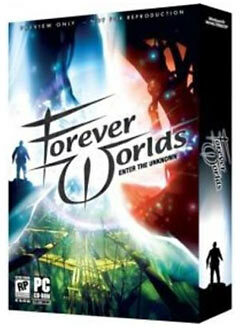 Forever Worlds (2004) was my shot at going back to a CD-ROM title. This time, the production company was called Hexagon Entertainment. By then, we had entered the 21st Century and the CD-ROM was becoming "ancient history" in terms of technology. The next popular game platform was comprised of Playstation, X-Box and Nintendo. It had finally found its legs and taken over the dance floor. This was not the original box of the game, but it quickly became the box people recognized. As far as I know, you can still buy it on Amazon and EBAY. Note the 4 out of 5 stars rating from Computer Gaming World right on the cover of the game box. Getting four stars was getting really tough back then in 1997 and would have translated into great sales if the product had been available in stores.